(9-3) Georgia defends its top ranking in the East with a home series win over Vanderbilt 2-1. Dogs will travel to Tennessee next. (8-4) Tigers move up with a 2-1 home series victory over A&M. The visit a dangerous Mizzou team next. (8-4) Hogs win 2 of 3 at solid Auburn. After hitting a couple of speed bumps in their season the Hogs appear to be back on track. A visit to Vanderbilt is next. 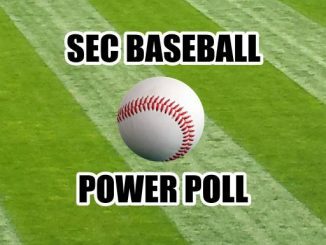 (8-4) Ole Miss scores a combined 40 runs in series sweep over Florida. A visit to Kentucky offers another sweep opportunity. (7-4-1) Aggies drop 2-1 series at LSU. 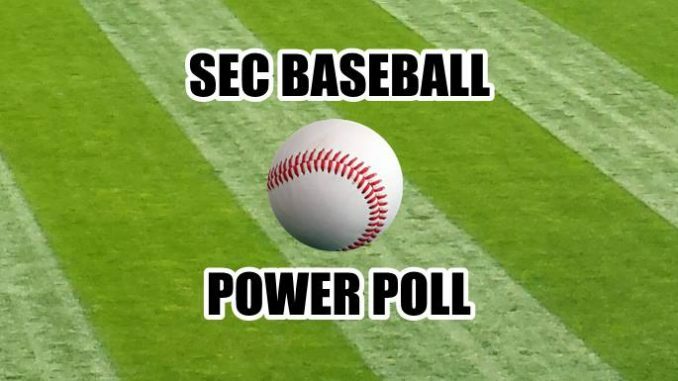 It’s tough to win road series in the SEC. Aggies host dangerous Auburn this weekend. (7-5) Vanderbilt’s offense stymied by Georgia in 2-1 series loss. 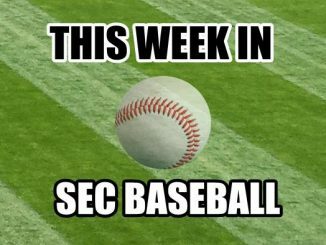 Vandy gets a visit from tough Arkansas team this weekend. (7-5) Auburn drops 2 of 3 to Arkansas at home. It doesn’t get any easier with a visit to A&M up next. (7-5) MSU wins 2 of 3 at scrappy Tennessee. Bulldogs get home series with Bama this weekend. (5-6-1) Missouri won a 2-1 home series over Kentucky. Tigers host a tough LSU team this weekend. (4-8) Gators suffer their second sweep by an SEC opponent of the season at Ole Miss. 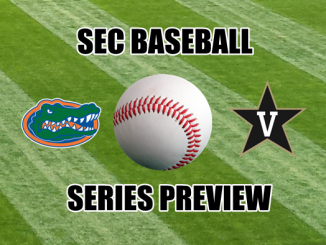 Gators could get back to .500 in the SEC with a home series this weekend with reeling S. Carolina. (4-8) Tennessee drops 2 of 3 at home to MSU. Vols host Georgia this weekend. (4-8) Bama took 2 of 3 from South Carolina in Tuscaloosa. Tide visits a very good MSU team next. 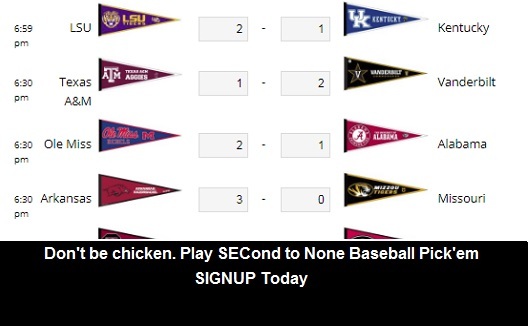 (3-9) The Gamecocks lost two of three at Alabama. A visit to Florida should be interesting. (2-10) The Wildcats nearly won a series at Mizzou. A 5-4 setback on Saturday was the difference. Visit to Oxford and Ole Miss is next.